According to the Time-for-Change forecasting model, which has correctly predicted the winner of the popular vote in every presidential election since 1988, Barack Obama has a good chance of winning a second term in the White House next November. The main reason for this is that the Democratic Party has only held the White House since 2008. That makes Obama a first-term incumbent, and first-term incumbents rarely lose. The Time-for-Change model is based on three predictors: the growth rate of the economy in the second quarter of the election year (Q2GDP), the president's net approval rating in late June or early July of the election year (JUNEAPP) and the time-for-change factor (CHANGE), which takes on the value of zero if the president's party has been in office for one term and one if the president's party has been in office for two or more terms. The model predicts the incumbent party's share of the major party vote (PV). PV = 51.7 + (.11*JUNEAPP) + (.54*Q2GDP) – (4.4*CHANGE). Could Barack Obama be the next Jimmy Carter? There is clearly a chance that he could, if the condition of the U.S. economy deteriorates in 2012 and/or the president's approval rating slips further into negative territory. But because of the first-term incumbent advantage, the model gives Obama a good chance of winning a second term even with fairly modest economic growth next year and an approval rating in the low- to mid-forties, as the following table shows. 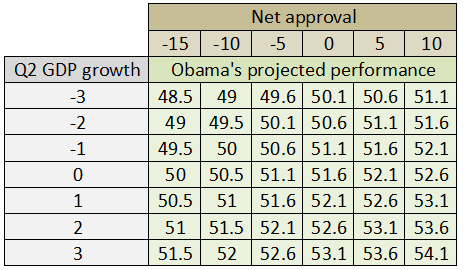 The table presents conditional forecasts of the Democratic share of the major party vote in 2012 depending on the growth rate of the economy in the second quarter and Barack Obama's net approval rating at mid-year. Source: Time-for-Change model and data compiled by author. Based on the president's average net approval rating in recent national polls, between -10% and -5%, and the estimated growth rate of the U.S. economy during the second quarter of 2011, 2.5%, Obama would be expected to win approximately 52% of the national popular vote, enough to almost certainly guarantee him a majority in the Electoral College. But the president clearly has little margin for error. A double-dip recession and/or a substantial decline in his approval rating could easily put him below 50%. In an article in the Nov. 6, 2011 Sunday New York Times Magazine, election guru and pundit Nate Silver of FiveThirtyEight.com argues 1, based on a statistical model of U.S. presidential elections, that Barack Obama faces a very difficult battle for a reelection if his opponent is Mitt Romney and if economic growth does not improve markedly in 2012. Silver's model includes three predictors -- the president's approval rating one year before the election, the growth rate of GDP in the year of the election and the ideological extremism of the opposing party's nominee based on a rating scale developed by the political scientist Marty Cohen and his colleagues in their 2008 book on the presidential nominating process. Based on these three factors, Silver presents some estimates of Barack Obama's chances of winning a second term depending on his current approval rating, the growth rate of the economy next year, and whether the Republican Party nominates Mitt Romney or a more conservative candidate. Obama does not fare well against Romney under most plausible economic growth scenarios but does somewhat better against other possible GOP candidates such as Herman Cain or Rick Perry. But there are several problems with Silver's model. First, it isn't really a forecasting model because the growth rate of the economy during the year of the election won't be known until long after the election is over. In addition, the measure of the opposition candidate's extremism is highly subjective. Many of these candidates in past elections did not have a voting record so the opinions of presidential historians were used to measure their extremism, but obviously different historians can reach different conclusions about a candidate's extremism. This raises the possibility that the ratings for past elections could have been influenced by the results of those elections or that Silver's own ratings of the 2012 GOP candidates could have been influenced by poll results showing Romney doing better than Cain or Perry against Obama. Moreover, it's not even clear that this variable works. Although it has a significant effect in Silver's own model, when it is added to the Time-for-Change model it is not statistically significant and the explanatory power of the model increases by less than one percentage point. More importantly, Silver's model may underestimate Barack Obama's chances of winning a second term in the White House because it does not take into account the advantage enjoyed by first-term incumbents. And that advantage, as we have seen, is quite substantial.